Please welcome author Kit Bakke to my blog today. Kit is a Seattle author who loves travel and was active in the antiwar movement during the 1960s and 70s. She has also worked as a hospice nurse. One of my favorite parts of having a blog is getting to know interesting writers like Kit! 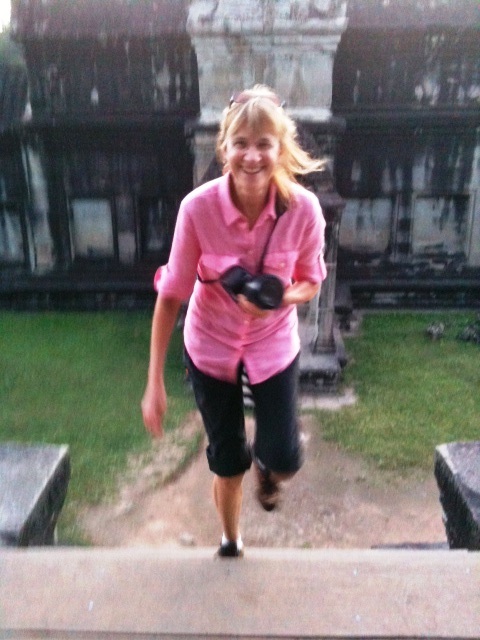 Kit Bakke going up a temple at Angkor Wat, Cambodia. I don’t listen to music when I write. Music tends to muddy my mind with happy memories, sad emotions or just plain distractions that mess with my ability to transfer readable words to the page. Which is odd, because, as British people would say, I am rubbish at music. Musical people, and by that I mean people who hear structure and tone in musical sounds and perhaps can even carry a tune, have abilities far beyond mine. I might as well try to walk a tightrope across the Grand Canyon. I’m pretty sure I’m tone deaf, because when I chat with people about the music we are listening to, it’s clear I am missing most of it. “Didn’t you love how that chord progression changes?” “That bit in F minor was amazing, wasn’t it?” I have no idea what they are talking about. When I was in the 8th grade, I was in a little after-school chorus. We had the chance to be on local TV at Christmas time, singing “Silver Bells.” I was excited, and sang my heart out in rehearsals. But right before we went on the air, the director told me not to sing at all. I should just mouth the words, he said, and not actually sing out loud. As I recall, I did as I was told, and that was the end of my participatory musical life, such as it was. My husband and I have season tickets to the Seattle Symphony; I go, I listen, I read the program and try to become an educated spectator of music. What is music, anyway? How is it different from sound? Is it like the difference between flowers and weeds—if it’s where you don’t want it, then it’s a weed? If you don’t like the sound, then it’s not music? Does any animal other than humans make music or appreciate music? Parrots might occasionally follow a beat, but is it really dancing? These questions interest me because I’ve been mulling over a fiction project about a woman who wants to become a world class orchestra conductor. So I decided I needed to know a thing or two about music and what it means to have music as the core of one’s life. Music, it turns out, is a language. Different musical traditions (western, eastern, etc.) have different internal rules, just like languages. Music changes over time, morphing along with historical preferences, just like language. Music is said to be especially good at mirroring and expressing grief and great happiness. Music lights up the limbic system in our brains—our ancient, emotional core. Music touches parts of our beings that are deeper than words ever penetrate. So here I am, being superficial, playing with mere words. Like a colorblind person trying to paint sunsets, I will keep at it, though, and search for ways to express music’s magic in the only way I can. Kit Bakke is the author of Dancing on the Edge and Miss Alcott’s E-mail. You can learn more about her on her website (www.kitbakke.com), and on her Amazon Author Page. Her Twitter handle is @KitBakke . This entry was posted in guest post, life experiences, music, music tuesday and tagged #musictuesday, chorus, kit bakke, music, Seattle Symphony, Silver Bells, tone deaf, tradition. Bookmark the permalink. My dear friend , Health and happiness to you in the New Year. With love Maxima ! Health and happiness to you as well, Maxima!